Graduate of Georgetown University, Washington, D.C. If Bill Ford were a Boy Scout, you’d have to add “American Business,” “Personal Management” and “Coin Collecting” to his merit badges—thanks to almost thirty years of income-generating investments under his belt. Bill has spent his entire career in the investment industry developing an expertise in fixed income securities, especially tax-free bonds. He works with institutional clients & individual investors and has developed a special talent for reducing the confusing world of investment options to solutions that are user friendly & easily understood. Helping people achieve their personal financial goals is what attracted Bill to the investment business. 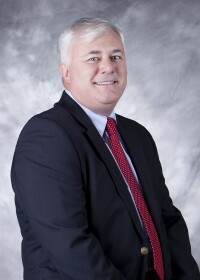 He has worked with many of his clients for his entire career, nearly 30 years. It is the close relationships that Bill develops with his clients that makes him special & continues to motivate him today. Bill finds it rewarding to partner with one client at a time to construct a customized investment portfolio. On a personal level, Bill is most proud of his three sons & helping them to get “on the right road” in their life journey. Bill and his wife, Diane, enjoy travel to new places and spending time with family & friends at their lake home in Northern Minnesota.